DIBLASI'S "50 THINGS I LOVE ABOUT FRANK"
THEATER FOR THE NEW CITY is pleased to announce the world premiere production of Gaspare Diblasi’s 50 THINGS I LOVE ABOUT FRANK, directed by Jesse Marchese (assistant to the Artistic Director of Off-Broadway’s award-winning Mint Theater Company). 50 THINGS I LOVE ABOUT FRANK will play a limited engagement at Theater for the New City , 155 1st Avenue (Between 9th and 10th Streets). New York, New York, 10003. Performances begin Saturday, September 1 and continue through Wednesday, September 5. Frank Stampoli can't catch a break: between business class, dance callbacks and coming out... Freshman year is tough. When he tells his family he has a boyfriend, his mother blames it on the fact that he hasn't found the right Italian girl. His father doesn't know what to say. And then there's Anthony... and those 50 things he loves about Frank. In the great tradition of Patti LuPone and Neil Simon comes an Italian-American, Brooklyn born-and-bred story about family, friendship, first boyfriends and pasta sauce. Come Meet The Stampoli’s, for a night you'll never forget! The production stars Gaspare DiBlasi* (A Chorus Line, Nat’l Tour) as Frank Stampoli, Margo Singaliese* (Louis LaRusso’s Sweatshop Off-Broadway; “Sopranos”, “Law and Order”) as Josephine Stampoli, Tommaso DiBlasi as Joey Stampoli, Vince Bandille as John Stampoli, Christian Castro (“Law and Order”) as Anthony, Alyson Leigh Rosenfeld (Voice of Nurse Joy on the animated series of “Pokémon” on Cartoon Network) as Nadine and Seth Grugle* (Next to Normal, Regional) as Jake/Doctor/Priest. *performing courtesy of Actors’ Equity Association. AEA approved showcase. The production features scenic design by Charlotte Vosselor, costume design by Kimberly Matela, and lighting design by David Pentz. Kate Brown is the sound designer, Michael Herwitz is the assistant director and Timothy James Macdonald is the stage manager. Tickets are $15 and are now available online at http://www.smarttix.com. Tickets may also be purchased in-person at the Theatre Box Office ½ hour prior to performance. Theater for the New City ,155 1st Avenue (Between 9th and 10th Streets). New York, New York, 10003. 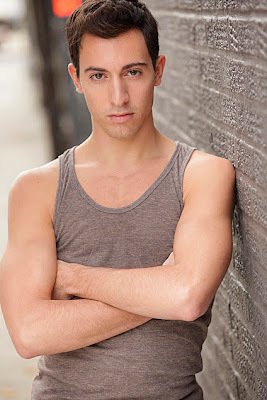 GASPARE DIBLASI (Playwright/Frank) is a 21-year-old actor/playwright residing in Brooklyn, New York. Gaspare is a recent graduate of Marymount Manhattan College where he received his B.A. in Theater Arts. In the fall he will be attending NYU for his masters in Educational Theater. Gaspare was last seen playing Vito in the School House Theaters production of The Time of The Cuckoo. Other credits include, The National Tour of A Chorus Line playing Paul and Off-Broadways Tony 'n' Tina's Wedding"covering Joey Vitale and Johnny Nunzio. 50 Things I love About Frank is Gaspare’s first full-length play that is inspired by his coming out to his Italian-American family, and failed first relationship. JESSE MARCHESE (Director) the Assistant to the Artistic Director of Off-Broadway’s award-winning Mint Theater Company where he recently assisted Richard Corley in directing Rutherford and Son by Githa Sowerby. Jesse’s work as a director was last represented Off-Broadway at New World Stages with MosesMogilee’s inaugural production of Ghosts of Provincetown: two one-act plays. Jesse assisted Adam Blanshay in directing The Apartment for the New York International Fringe Festival, where he also played the role of company manager for RadioTheatreNYC’s production of The Mole People in 2008. He is a graduate of Marymount Manhattan College where he directed both Falsettoland and You’re a Good Man, Charlie Brown. Through the college, Jesse was also able to assist Barbara Siman, Charles Repole and Patricia Birch on numerous workshops at the York Theatre. A proud member of AEA. THEATER FOR THE NEW CITY (TNC) is a Pulitzer Prize winning community cultural center that is known for its high artistic standards and widespread community service. One of New York’s most prolific theatrical organizations, TNC produces 30-40 premieres of new American plays per year, at least 10 of which are by emerging and young playwrights. Many influential theater artists of the last quarter century have found TNC’s Resident Theater Program instrumental to their careers, among them Sam Shepard, Moises Kaufman, Richard Foreman, Charles Busch, Maria Irene Fornes, Miguel Piñero, Jean-Claude van Itallie, Vin Diesel, Oscar Nuñez, Laurence Holder, Romulus Linney and Academy Award Winners Tim Robbins and Adrien Brody. TNC also presents plays by multi-ethnic/multi-disciplinary theater companies who have no permanent home. Among the well-known companies that have been presented by TNC are Mabou Mines, the Living Theater, Bread and Puppet Theater, the San Francisco Mime Troup and COBU, the Japanese women's drumming and dance group. TNC also produced the Yangtze Repertory Company’s 1997 production of BETWEEN LIFE AND DEATH, which was the only play ever produced in America by Gao Xingjian before he won the 2000 Nobel Prize for Literature. TNC seeks to develop theater audiences and inspire future theater artists from the often-overlooked low-income minority communities of New York City by producing minority writers from around the world and by bringing the community into theater and theater into the community through its many free Festivals. TNC productions have won the Pulitzer Prize for Drama and over 42 OBIE Awards for excellence in every theatrical discipline. TNC is also the only Theatrical Organization to have won the Mayor's Stop The Violence award.